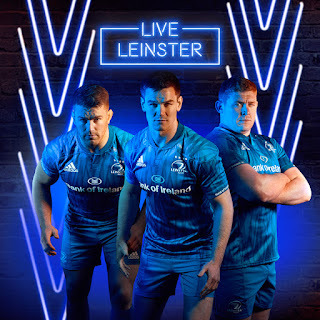 This Harpin Points feature is meant to cover topics outside the scope of Leinster and Ireland rugby but there have been so many announcements surrounding the boys in blue this week already that I can hardly ignore them! First up was Sexton being made skipper. I have stated here many times that I'd prefer an out half to be spared the captain's responsibility. That said I'd also prefer an out half to be mindful of throwing himself head first into too many tackles or indeed carrying the ball too many times towards opposition who are likely to be targeting him. And I certainly wouldn't prefer an outhalf to trying drop goal from an improbable range in the dying seconds of a close match in Paris if there was a possibility of a few more phases from our forwards could get us even closer to the posts. I think you see what I'm getting at...all of the above 'preferences' are based on the supposed 'standard' professional 10...Sexton has taken those standards and raised them considerably and has a bucketload of medals to back up all of those decisions. So if he wants to be Leinster skipper then I'm certainly not going to complain - besides, he's never shy about talking to the ref anyway so this way they'll have to listen! Rhys is also good choice as vice captain...some say the appointment suggests he won't figure in Joe Schmidt's plans but I very much doubt that - in fact I'd say it means the exact opposite. Leinster have plenty of leaders to take the armband should both Johnny and Rhys be elsewhere on Pro14 days. RDS to be redeveloped to increase arena capacity to 25k, with design to be chosen by means of an international architectural competition. Then just over two years later there were articles like this one in the Evening Herald about redevelopment plans complete with a snazzy artist's impression of what the new arena could look like. "The existing Anglesea stand was built in the early 1930s...and its proposed replacement will accommodate 6,481 patrons, representing an increase of 738." Hardly a figure to knock your socks off, is it? Surely the whole point of redevelopment would be to considerably close the capacity gap between the RDS and Aviva? Yes, I know it's not all about the extra seating, with dressing rooms, coaches boxes, general amenities, perhaps a new media box, and of course there's a lot of revenue to be gained from corporate boxes and hospitality facilities. But even given all of that I can't get over that low number of 738. I hope that if and when the work is finally completed, the overall increase is much bigger, I hope there is still room for a standing area where the 'Laighin Pit' banner has been proudly unfurled in the Anglesea Stand at home matches, and possibly most importantly, I hope it will be much less than two years before we hear about this again. So there it is, the new Leinster home jersey made by our new kit manufacturer Adidas. Between Leinster and Ireland there have been at least a couple of dozen such launches since we've been harping on rugby via these pages and each and every time there are a host of negative comments so forgive me if I'm a tad suspicious of at least a percentage of them. Some could be genuine, some could be people who are never satisfied anyway, and putting on my tin foil hat, perhaps a few from rival companies who missed out on the gig. That's not to say we have to love every design of course, but much like the internet in general it's often hard to weed out the genuine opinion. My own view is similar to that of the training gear. Had I not gotten used to seeing similar designs on another Irish province, I probably wouldn't see anything wrong with this range but especially when that province is Munster, it could take a while before I get used to the Leinster harp on it. Though perhaps the presence of the four stars will make that process all the easier... 😜. And on that subject, many are concerned that they're off-centre, but most of those online complaints have been met with the response :"They're just leaving room for number 5"!!! As always with these launches, the impression you get when you first see the product on social media can be very different to that when you see it in the flesh, and if the lads come anywhere close to last year's form and results, I very much doubt if either Adidas or Life Style Sports have much to worry about in the sales department. We all knew the Crusaders were going to win relatively easily, right? Yeah, of course we did. But perhaps not quite this way. Forgive the pun but the South African franchise really did have the Lions' share of possession in the early stages yet each and every time they got into the 'Saders 22 the home defence was there to stop them. Even their mauling off attacking lineouts which, along with the tournament format, played a big role in them reaching this final, wasn't enough to get pasts the swarming tackling and jackling of their hosts. While they struggled to score down one end, when the Crusaders had the ball, it was pass, run, pass, cheeky offload, sprint, maybe the odd recycle, another pass, try. Then again. Then again. Not surprisingly the debate raged on Irish twitter over the possibility of the southern hemisphere champs playing Leinster. I already touched on this in a previous edition of Harpin Points but I don't mind repeating...yes, of course a Crusaders v Leinster matchup would be worth seeing but ONLY if both teams were at the same part of their seasons and that could only happen if both European and Super Rugby finals were around the same time, which would effectively make them semifinals. To instead force a match onto the schedule would not make the clash a de facto World Club championship - in reality it would be an over-hyped exhibition IMO like English football's Community Shield. In all seriousness, watching the hockey matches (I saw their final group game v England plus all the knockouts) linked the two sports in another way in that it made me appreciate what it's like to be an active supporter of a sport when I don't fully understand the rules. Let's face it...rugby fans are among the biggest intellectual snobs in sport, with possibly only cricket being worse. It actually annoys us when we hear someone at the match shouting about something they're totally wrong about. Come on, you can admit it, this is a safe space!!! Well despite having watched several hockey matches I still have no idea what makes a corner long or short, or why there's a green card, or numerous other things. Yet I still enjoyed it and if I had the time I wouldn't mind getting to know the sport a bit better, be it men or women. But there's only so many hours in the sporting weekend, and, well, I have this website so...egg-chasing will always take priority. And as for the argument I saw in several places "Why do we only pay attention to teams when they're winning?". Come on. Really? That's not an 'anti-minority sport' thing. Nor is it even exclusively a sporting thing. It's a human nature thing.